The Ford Explorer underwent a full redesign 3 years ago, added a turbocharged 4-cylinder engine option 2 years ago and came out with a high-performance trim level and some comfort features last year. For 2014, Ford has made only minor changes to the Explorer, but there are rumors that a restyling is on the horizon in the next few years. The 2011 redesign transformed the Explorer from a rough-and-tumble truck-based SUV to a more stylish, family-oriented crossover with more interior room, better handling and higher fuel efficiency. Adding the 2.0-liter, turbocharged inline 4-cylinder in 2012 continued that transformation, giving consumers even more fuel-efficient options. With last year's addition of the Sport trim level with its 3.5-liter turbocharged V6 and sport-tuned suspension, as well as an available power heated steering wheel, a lane-departure and lane-keeping assist system, and xenon headlights with automatic high-beam control, Ford gave Explorer-loving families a wider range of luxury and performance choices. The Explorer's minor changes for 2014 are on the cosmetic and comfort side. There are two new paint options—Sunset (a reddish orange) and Dark Side (deep gray with a tint of blue)—which replace the Ginger Ale Metallic and Green Gem Metallic paint choices from last year. All trim levels (Base, XLT, Limited and Sport) will now come standard with automatic headlamps, and second-row heated seats are now standard for the Limited trim. Other than those tweaks, the 2014 Explorer is a carryover from 2013. The standard engine for all trims is a 3.5-liter V6 that produces 290 hp at 6,500 rpm and 270 lb-ft of torque at 3,000 rpm. It gets 17 mpg city/24 highway with front-wheel drive and 17/23 with all-wheel drive. The 2.0-liter turbocharged I4 with EcoBoost generates 240 horsepower at 5,500 rpm and 270 lb-ft of torque at 3,000 rpm and gets 20/28. The 3.5-liter turbocharged V6 with EcoBoost, available only for the Sport trim, creates 365 horsepower at 5,550 rpm and 350 lb-ft of torque at 3,500 rpm. It gets 16/22 when paired with AWD, which is standard for the Sport trim. All these engine options are paired with a 6-speed automatic transmission. The V6 engines get Ford's SelectShift system, which allows for manual shifting, and the Sport trim makes that happen with paddle shifters. The Explorer's cabin is comprised of stylish lines and quality materials. The Base trim's standard features include a 6-way power driver's seat with lumbar support, a 6-speaker stereo with CD and MP3, a media hub with auxiliary input jack, 4.2-inch LCD color display for fuel, speedometer and tachometer, 60/40-split second-row bench that folds flat, a 50/50-split and folding third row, audio and speed controls on the steering wheel, four 12-volt power points, power locks and windows with driver's one-touch down and a cabin air filter. Other standard features include Hill Start Assist, AdvanceTrac with Roll Stability Control, keyless entry, a tire pressure monitoring system, 17-inch steel wheels, dual chrome exhaust, power mirrors, roof side rails, body-color spoiler, and on the AWD models, Hill Descent Control, Terrain Management System (allowing the driver to switch between snow, mud or ruts with the turn of a knob) and front recovery hooks. The XLT has all the Base's standard features and adds features like heavy-duty front and rear brake calipers, 18-inch aluminum wheels, chrome door handles, heated mirrors with LED signal indicators, fog lamps, leather-wrapped shift knob and steering wheel, illuminated visors, USB port, SecuriCode keyless-entry keypad, Sirius Satellite Radio and MyFord with Sync, a voice-activated communications and entertainment system with 911 assist and vehicle health reports. The Limited and Sports trims both build off the XLT's features. The Limited Explorer's additions include 20-inch painted aluminum wheels, power-folding mirrors with driver's side memory, adjustable pedals with memory, leather-trimmed seats with a heated first row, 10-way adjustable driver's seat with memory, the new heated 60/40 second-row bench, 12-speaker premium audio system by Sony with HD Radio, 8-inch color LCD touchscreen for MyFord with Sync that also includes traffic reports, GPS navigation and information services, remote start, rear-view camera, ambient lighting, dual-zone automatic temperature control, electrochromic rear-view mirror and a Universal garage door opener. In addition to the turbocharged V6, sport-tuned suspension and paddle shifters, the Sport trim also ups the XLT's standard features with goodies like 20-inch machined aluminum wheels with painted pockets, a 58-amp-hour battery, ebony painted grille with Sterling Grey mesh, blackout treatment on the headlamps and taillamps, “Explorer” badge on hood, lighted scuff plates, perforated leather-trimmed seats, heated front seats, 10-way power driver's seat, 6-way power passenger seat, 12-speaker premium audio system by Sony with HD radio and dual-zone electronic automatic temperature control. The Explorer earned 5 out of 5 stars in government crash tests and got a top score of Good in the frontal-offset, side-impact and roof-strength tests by the Insurance Institute for Highway Safety. All 2014 Explorers have standard side curtain airbags, front seat side airbags, a front passenger knee airbag, trailer sway control, traction control and stability control, which is enhanced by Ford's Curve Control system, which can automatically slow the vehicle if too much speed is carried into a corner. 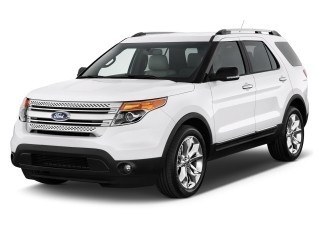 What's your take on the 2014 Ford Explorer? tbowles I bought my Explorer in 12/7/13. I drive for a living and after driving the Explorer I think the car is VERY unsafe. Way TOO many blind spots. Not driver friendly at all. I had a 2003 Explorer, put 237K miles on it. Bought a Tahoe in 2005, 241K miles. This new Explorer will never last this long. This car is Cheap, not inexpensive, just cheap. I have only myself to blame, as I test drove the Explorer around the block. I assume most all cars in this class are cheap. Charge you more and give you less. The American way. Chuck I just bought the 2014 Sport model and so far I am just lovin' it! Although it has the blind spot warning lights on the side view mirrors, I didn't want to put 100% trust in them, so I put on some small fish-eye mirrors as I have done on all my prior cars. A quick glance let's you know if someone's there or not. Power is unbelievable with the twin turbo-charged 365 HP 3.5L engine! I'm looking forward to see how it tows my dual jet ski trailer this summer. The rear view camera will come in handy, for sure. The technology in this car is amazing. Blue tooth everything. Ford MySync communicates with all the features in the car. The heated seats are a blessing! Can't wait to try out the A/C seats this summer! The Sony sound system is off the hook! Wonderful sound and power! My prior vehicle was a 2001 Ford Explorer Sport Trac. It's gone 13 years without a major problem. If this Sport can do the same, I'll be a happy camper. But just in case, I purchased the extended warranty: 7yrs or 75K miles. The car is a beauty as well. I paid extra for the Platinum White paint job. It sparkles in the sun like a real gem! Beautiful car. Tyrone My wife got the XLT FWD she loves it smooth ride plenty of room love the 3rd row seats. It does have its blind spots though seems like all the newer cars have them. But ford has stepped there game up big time!! Users ranked 2014 Ford Explorer against other cars which they drove/owned. Each ranking was based on 9 categories. Here is the summary of top rankings. 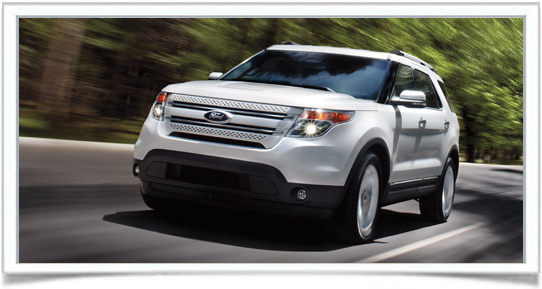 Have you driven a 2014 Ford Explorer? Can I swap a 017 front clip onto a 014. Will it fit and line up? On a 014 explorer.